The struggling Catholic University of America softball team began to right the course of its season after splitting a two game road series against the Mustangs of Stevenson University. The Lady Cards won the first of the two matchups in convincing fashion, 9-5. The Cardinals lost the second game 8-2, but carried momentum winning the last 5 of their 8 games with three conference matchups to come. Sophomore catcher Marissa Deblasie is excited about the team’s play recently. “Building our momentum as a team is really important moving forward, especially as we move into April, because it gives us added confidence and strength as a team to want to succeed and see a future winning together,” Deblasie said. The Cardinals did not take long in getting onto the scoreboard, when they earned three in the top of the second inning. Catcher Kacie Badolato and outfielder Taylor Forgen both drew walks to set up runners on first and second with two outs as freshman Makayla Czan walked up to the plate. The freshman from Hyattsville, Md. hit her fourth home run of the season to put the CUA side up 3-0. 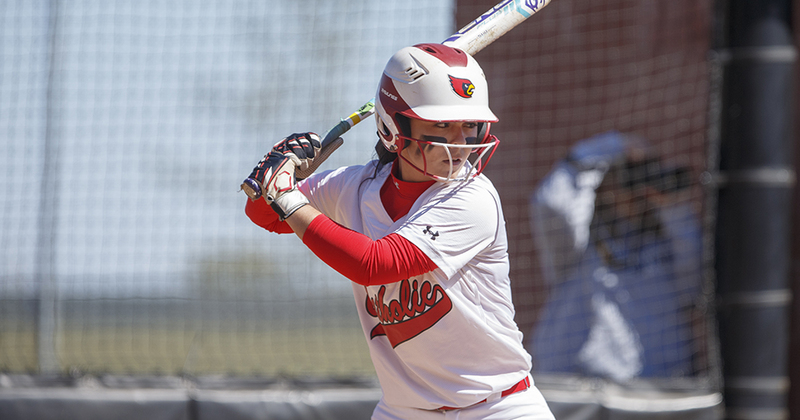 The score remained unchanged until the top of the fifth inning, when freshman Juliet Lodes ripped a single down the third base line to bring home second baseman Hailey Horton and put the Cards up 4-0. The Birds loosened their grip on their opponents in the bottom of the same inning however. Stevenson grabbed 2 in the inning, one unearned on an errant throw from Lodes to home. The second came at the next at bat when starting pitcher Sabrina Scott gave up a single to right. Stevenson brought the game to within one run as they hit a solo home-run, but the Cards came roaring back to life off the bat of Deblasie. Lodes recorded her 4th RBI of the game on another single scoring a pinch runner. Scott and Badolato both singled to load the bases for their catcher, who went yard on a grand slam to give the Cardinals a 9-3 lead. Stevenson managed to score 2 more runs in the bottom of the final inning, but CUA held the Mustangs off to win 9-5. The Tilton, New Hampshire resident did not feel the pressure in the moment and stayed calm when her time at the plate came. The Lady Cards return to action this coming weekend on the road in a conference matchup against Elizabethtown. This is a meaningful matchup for Catholic since the team sits at 2-4 in conference play and need to start winning in conference to keep its playoff hopes alive. The series will be the only time the two sides will meet this regular season, but the Blue Jays sit second in the conference with a 12-2 (2-0) record. The first half of the double header begins at 1 PM on Saturday, February 5th, and the second leg at 3 PM, weather permitting.